EPW022383 ENGLAND (1928). 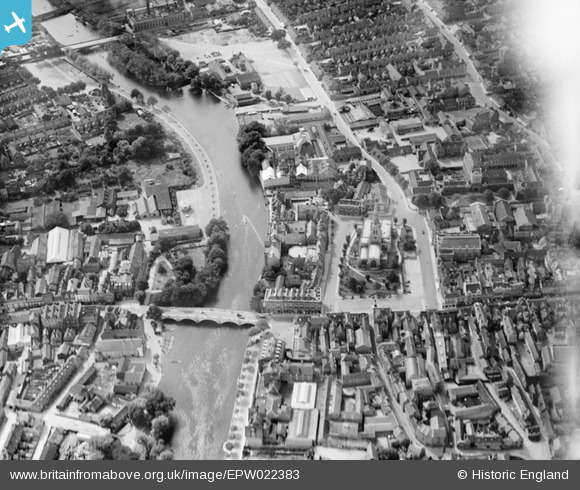 St Paul's Church and the Bedford Bridge, Bedford, 1928. Title [EPW022383] St Paul's Church and the Bedford Bridge, Bedford, 1928. One of Mr Smith's Silvery Ouse pleasure boats heading up river towards Queens Park. Longhurst & Skinner on the corner of River Street & Midland Road. The building is still there but it is now a J.D. Wetherspoon's pub called Pilgrims Progress. The attached photo was taken on the 5th April 2009. Henry Longhurst, the son of the founder, became a golfing commentator. For more details see http://en.wikipedia.org/wiki/Henry_Longhurst. Now the Star Rowing Club. Golden Eagle public house at 34 Castle Lane. The attached photo was taken in the mid 1960's. Castle Lane. Although very narrow, this used to be for two way traffic but is now pedestrianized. Bank Buildings, no longer there. Statue of John Howard. The attached photo was taken on the 10th December 2013. I'm hoping this picture will help to prove that the John Howard Statue was moved, albeit slightly, from it's original position on St Paul's Square, during the early 1970's. This happened when the Statue was placed on the base of the old Fountain. Can anyone help to settle this please? You may be right in that the statue was moved, but I cannot find reference to it. The base of the statue was originally the base of the Thomas Westley Turnley water fountain which stood nearer the corner of the square which is towards the river. It is mentioned on the Bedford virtual library web site http://virtual-library.culturalservices.net/webingres/bedfordshire/vlib//0.digitised_resources/bedford_streets_highst_turnley_article.htm.